NEW YORK, Dec. 4, 2018 /PRNewswire/ -- FoodMarble, a pioneering digestive health tech startup, is launching sales of the world's first personal digestive tracker on December 4, 2018. 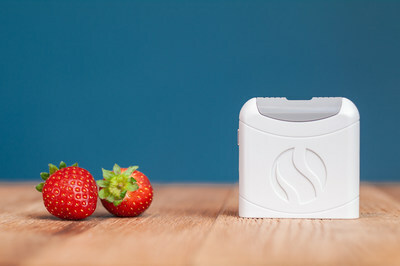 The pocket-sized breath analysis device and app uses leading digestive science to help users identify problem foods and improve their overall wellbeing. Aonghus Shortt, CEO and co-founder of FoodMarble, began working on the product in 2015. "After seeing the impact that digestive problems had on my girlfriend's life, I wanted to create a tool that could empower individuals to take control of their digestive health, learn more about what causes their uncomfortable digestive symptoms and improve their wellbeing," he said. FoodMarble AIRE is available to purchase at $159 (incl. shipping) from December 4, 2018 on FoodMarble.com. To date, breath testing for digestive issues has only been available in hospitals or medical clinics. These tests aren't easily accessible and can be expensive. Using the latest sensor technology, FoodMarble has created a pocket-sized breath analysis device to help users track their digestion in real time. The FoodMarble app prompts users to log their food and symptoms and take breath tests to track how well they're digesting. When food isn't fully digested, it's fermented in the gut, creating hydrogen. Since some of this hydrogen is ultimately exhaled, FoodMarble AIRE is able to show whether food has been fully digested by measuring hydrogen levels on the breath. As more breath tests, foods and symptoms are logged, the app gives the user insights into how different foods, sleep quality and stress affect their digestive health. "Digestive discomfort triggered by food, including many healthy foods, is one of the most common digestive issues. While food diaries are often used, quantifying the impact different foods have on your body can be very difficult," said Dr. James Brief, FoodMarble Chief Medical Officer and gastroenterologist. "Our goal was to create a data-based solution to help our users understand their digestion and use data to find foods most compatible with their digestive system," he said. More than 8,000 people around the world pre-ordered the FoodMarble AIRE. The final batch of pre-orders ship this week and general sales begin December 4.